Audio, over the last decade has come a long way from concert halls, AM/FM, and satellite radio. Online radio alone has been around since 1990 with such services as Rhapsody, and more recently Pandora.com. So the engineers at Logitech have now added another facet to what, where and how music lovers can enjoy music called Squeezebox Duet. The “Squeezebox Duet” by Logitech has the ability to access and listen to music from your online radio account and play it to your home theater system or any RCA or digital audio input device. 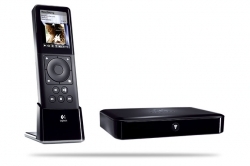 TechwareLabs has reviewed several types of home audio systems such as Abit Airpace, and the Squeezebox by Slim Designs which is owned by Logitech. Both of these products (Abit Airpace, and Slim Designs Squeezebox) have some very nice features, but the Squeezebox Duet by Logitech has its own positive and very nice features that are unique. Let’s take a look. 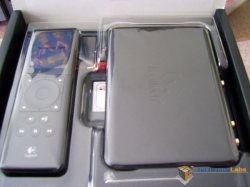 The Logitech Squeezebox Duet comes in a box which has the Logitech signature colors and a few photos of the product inside. 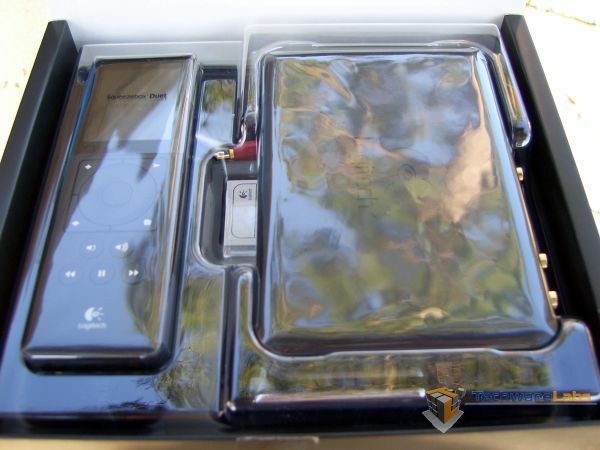 Unpacking the product we can see this product isn’t your standard shrink wrap and go type. The Squeezebox Duet comes in a black box inside the exterior white and light-green Logitech box. 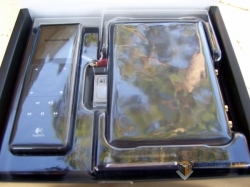 The black Squeezebox box opens up like a jewelry box which the lid holds advertisement material which comes shooting out once the lid is just over 120 degrees. 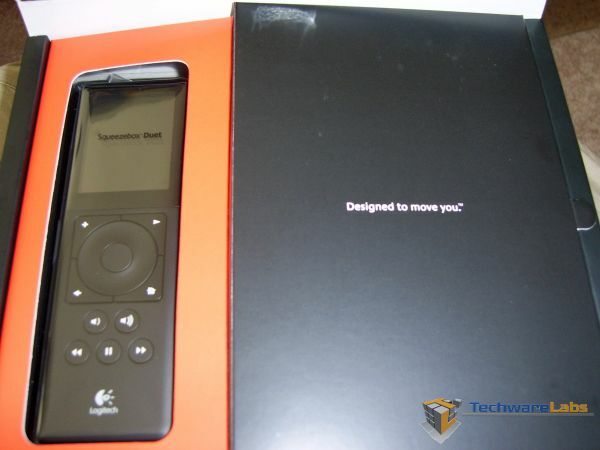 Once the black box is opened you get a view of the remote in its simplicity and slick looks. Next, flipping an inner cover we reveal the Squeezebox Receiver and a few cables and a cradle for the controller. 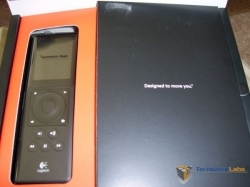 Logitech spent some quality time designing the packaging of all the contents. The way everything was laid-out and displayed and wrapped was very well thought out and eye catching. Very Nice job on the inital presentation! Removing the first cover to view the two main components. 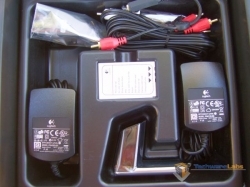 The cradle and the power adapter for the Receiver both have a universal plug which in our package only came with the U.S. 110v adapter. 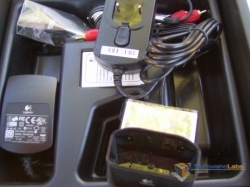 There is a plastic bag covering both main components which was very impressive After removing the controller and receiver we get a look at the rest of the components. Agreed the price is a little much, and you can use your PC to connect to your home stereo and play your music source. The duet is for the consumer who doesn’t want to commit their PC to their home stereo (one possible reason). The Duet also comes with an awesome remote that connects via your wireless access point so you don’t have to be in the room to change settings/songs etc. So if you have the money, it is worth it. I have been using mine ever since this review was posted and it has been very handy. If I had the extra money, I’d likely build a media PC and connect that to my home stereo. 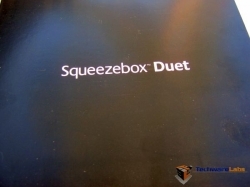 The media PC wouldn’t have a remote like the squeezebox duet that I could use in other rooms of the house, but if the price of the duet was cheaper than a media PC and all I was looking to just play music, I would favor the Duet. get a bluetooth audio link – no? Correct. The controller is wireless 802.11b/g, and it has an RJ45 also. Wireless is the way to go. No it doesn’t. Neither does the receiver. It’s all wireless.